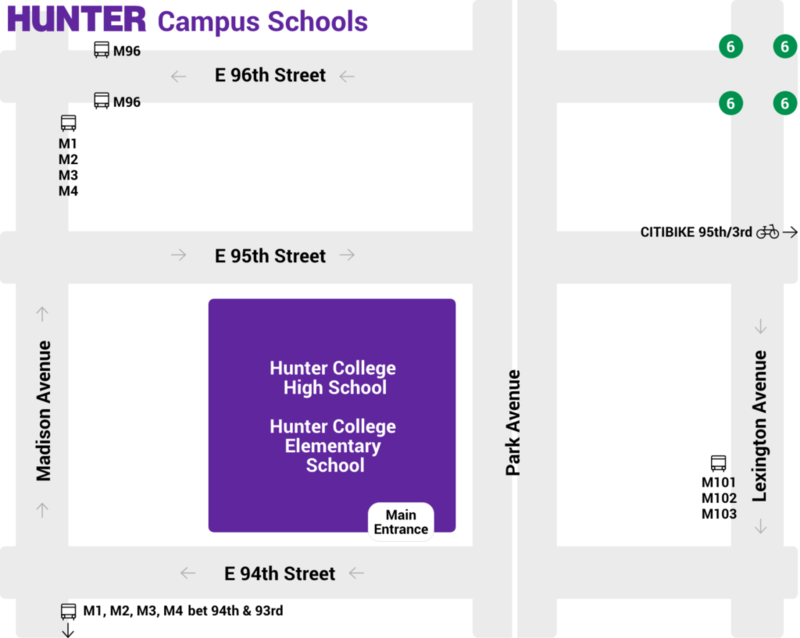 Hunter College Campus Schools include the Hunter College High School and Hunter College Elementary School. Take the 6 train to East 96th Street and Lexington Avenue. Exit the subway station and walk two blocks south to East 94th Street. Then, walk west along East 94th Street. The Campus Schools are located on the north side of the block between Park Avenue and Madison Avenues. Crosstown: Take the M96 to Park Avenue and East 96th Street. Walk south along Park Avenue to East 94th Street, or exit the M96 bus on Lexington Avenue and take a downtown bus (listed below). The campus schools are located on East 94th Street between Park and Madison avenues. Going Downtown: Take the M98, M101, M102 or M103 to East 94th Street and Lexington Avenue. Walk one block west to Park Avenue. The campus schools are located on East 94th Street between Park and Madison avenues. Going Uptown: Take the M1, M2, M3 or M4 to East 94th Street and Madison Avenue. Walk one block east to Park Avenue. The campus schools are located on East 94th Street between Park and Madison Avenues. Take the Long Island Expressway to the Queens Midtown Tunnel. After exiting the tunnel, proceed to Madison Avenue and make a right. Proceed north to 94th Street. Make a right turn onto 94th Street. The Campus Schools are located between Park and Madison Avenues. Take the New York Thruway (I-87) to the Major Deegan Expressway. Continue over the 3rd Avenue Bridge to the FDR Drive. Take Exit 15 (106th Street). Continue straight to Fifth Avenue (Museum Mile). Turn left (south) on 5th Avenue and continue to East 94th Street. Turn left onto East 94th Street. Take the Lincoln Tunnel. After exiting the tunnel, take 10th Avenue north. Turn right on 96th Street and proceed through Central Park. At Fifth Avenue (Museum Mile), turn right. Continue to East 94th Street and turn left. The Campus Schools are located between Madison and Park Avenues. Take the George Washington Bridge to the Harlem River Drive. Continue to the FDR Drive. Take Exit 15 (106th Street). Continue straight to Fifth Avenue (Museum Mile). Turn left (south) on 5th Avenue and continue to East 94th Street. Turn left onto East 94th Street.